In a passage about the Ulster Society for Promoting the Education of the Deaf, Dumb and Blind, I cam across this line – “one of the most fascinating writers of our day, […] who, having become deaf in her youth, is obliged to hold communications by means of an interpreter, – Charlotte Elizabeth, – a name known throughout the world” (Report of the Ulster Society for 1838, p.13). Since she seems to have faded from memory, I thought her a fitting subject. Charlotte Elizabeth Tonna, (nee Browne) was born in Norwich on 1st October 1790, where her High Tory father was a minor canon (ODNB). He mother was of Scottish covenenter descent, and with such parents she grew up inculcated with strongly anti-catholic views (Murphy 2005). A sickly child, she became deaf when aged 10, then threw herself into reading and literature. 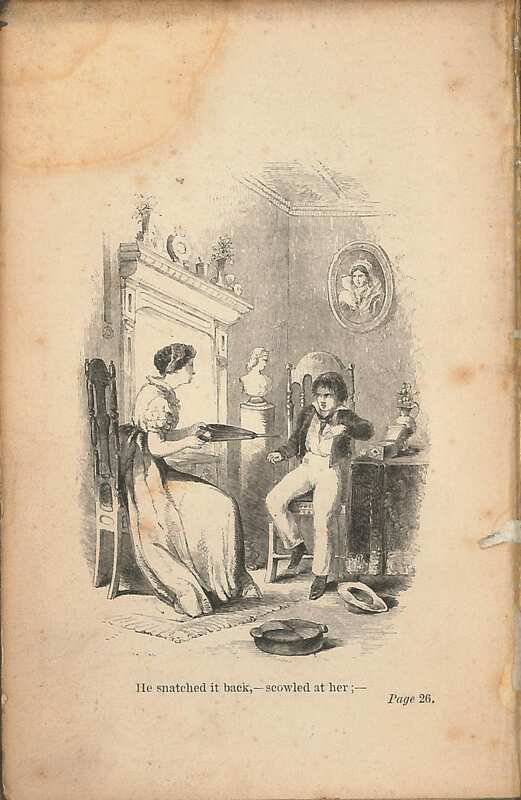 “Later in life she came to see this fascination as sinful because it served no useful, religious purpose, but her early reading in drama, poetry, and fiction provided excellent preparation for her future writing career.” (ibid) She influenced both Harriet Beecher Stowe and Elizabeth Gaskell. She married Captain George Phelan and moved with him to Canada for two years, then to his estate in Kilkenny. He was abusive to her, and we are told this was a symptom of oncoming insanity. After he died she married a much younger man, the evangelical writer Lewis Hippolytus Joseph Tonna. In 1823 in Kilkenny she came across a deaf boy called Sylvester, aged 12 to 13, but though he seemed to be intelligent, “he had no thought beyond his personal gratification, of which one part indeed, consisted in pleasing his friend” (p.9), but then in October he brought along ‘Jack’ (John), who made much better progress while Sylvester ceased to come to her. Large alphabet letters were used to teach him words like ‘dog’ and ‘man’, while the illustration shows how she tried to show him that there was a God by puffing bellows – he then said “God like wind! God like Wind!” (p.27). We learn from the Memoir of John Britt that Charlotte was expert at ‘Dactylology’ or finger spelling (p.13). One wonders if there was a little confusion and if the compiler was aware of the possibility that she was signing with people as well as finger-spelling. The aim of her education seems to have been to take him from a ‘natural’ Atheism through to a belief in God, and not the Popish God she so disliked – “Two things his soul abhorred – Satan and Popery” (Memoirs p.52). These were her prejudices, or perhaps rather genuinely held beliefs, that she was filling him with, that she had absorbed from her parents. When she left Ireland, she took him with her, moving to Clifton with her brother for a time. John Britt died in 1831 of consumption after a long illness of over a year – “sometimes when greatly oppressed, leeches were applied, and once half a dozen were put on his side, at his own request”(Memoir p.124). The Happy Mute begins with the quotation in the title of this page, “a year and a half has scarcely passed since I saw him depart to be with Christ ; and often do I look back with thankful wonder on his short but happy life – his slow and painful, yet most joyful death ; and I look forward to the period when, through the blood of that saviour whom he so dearly loved, I hope to meet my precious charge in the mansions of glory” (p.7). The happy mute; or, The dumb child’s appeal. 8th ed. London, L. and G. Seeley, Dublin, William Curry, and Robertson, 1841. Memoir of John Britt, the happy mute; compiled from the writings, letters, and conversation of Charlotte Elizabeth. 2nd ed. London, Seeleys, 1854. Edmund Symes-Thompson (1837-1907) was born in Keppel Street in London, in the house next door to that where Anthony Trollope had been born in 1815. His father Dr Theophilus Thompson F.R.S. (1807-60) was one of the founders of the Brompton Hospital, where he was an expert in Consumption, and according to his DNB entry “is credited with being the person who introduced cod-liver oil into England”, no doubt endearing him to generations of children then yet unborn. Edmund followed his father into the medical profession, training at Kings College London where he won several prizes. He too went to work at the Brompton Hospital and became an expert in chest diseases. Symes-Thompson subscribed to the view that Deaf people were more likely to suffer from pulmonary diseases than the hearing, promoting those views at the Milan Congress in 1881 (Esmail p.245). Here is the Symes-Thompson Milan paper. After his death his wife gathered together materials to produced a book about his life called Memories of Edmund Symes-Thompson M.D., F.R.C.P. A Follower of St. Luke. In it we can read about the origins of the Ealing College for Training Teachers of the Deaf and Symes-Thompson’s links with that organisation. An English gentleman of high abilities, the late Mr. Arthur Kinsey, was sent by Mr. Ackers to Germany and elsewhere and thoroughly trained, and then in 1877, with the warm sympathy and aid of Dr. and Mrs. Symes-Thompson and other friends of the deaf, the ‘Society for Training Teachers of the Deaf and for the Diffusion of the German System’ was formed. Dr. Symes-Thompson threw himself the more heartily into the scheme because, as Senior Physician to the Brompton Hospital for Consumption, his long and keen observation led him to note that the deaf – in those days not taught to speak – were specially liable to consumption for want of properly exercising their vocal organs. 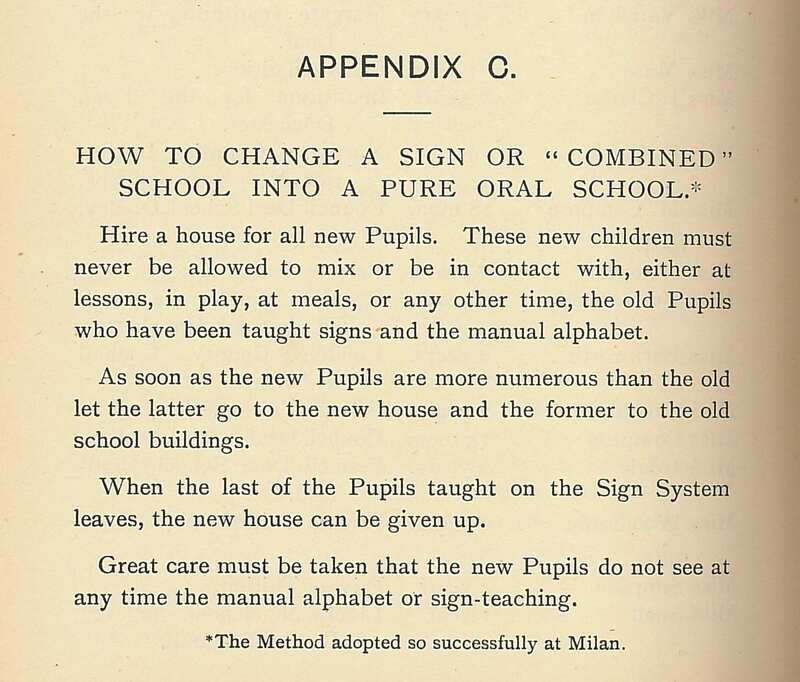 The following year the Training College for Teachers of the Deaf, with Mr. Kinsey as Principal, was opened at Ealing, with a small practising school attached; for, needless to say, students cannot be trained unless they can see how deaf children are taught, the way in which sounds have to be developed, ideas drawn out, and language imparted. Edmund Symes-Thompson was a member of the Society for the remainder of his life, ending as Chairman. It may be instructive, if slightly shocking to a modern reader, to see quite how determined the Society was to stop children signing – this ‘Appendix C’ below comes from the 1906 report, the year Symes-Thompson died. 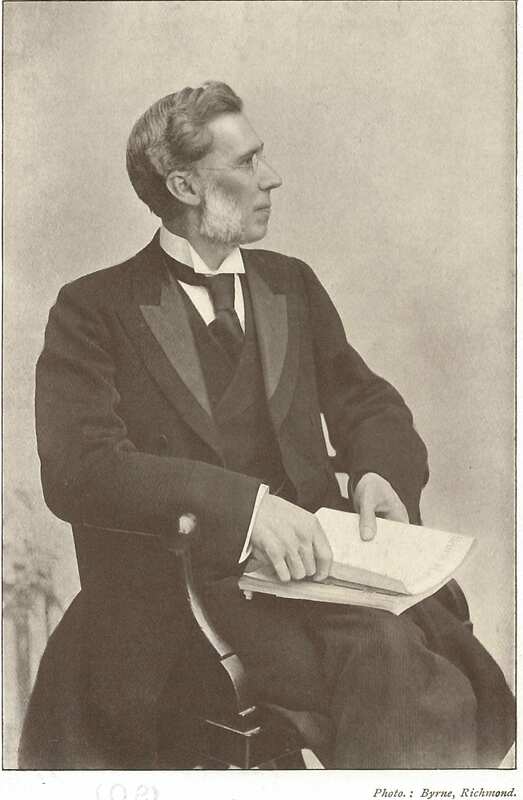 In 1899 Charles Mansfield Owen, who was a member of The Royal Association in Aid of the Deaf and Dumb, wrote a pamphlet where he set out his opposition to the views on oralism and societies for the deaf, that Symes-Thompson had expressed to the English Bishops in a circular letter on Missions to the Deaf and Dumb. Owen wrote “His letter (however unintentionally), is likely to do considerable injury to the cause of these Missions” and proceeded to give answer in the Spiritual Care of the Adult Deaf and Dumb. We should note that despite Symes-Thompson’s interest in the deaf, I cannot find a mention of him in Neil Weir’s Otolaryngology: An Illustrated History and he was not an otolaryngologist. It would be interesting to see what his contemporaries who were otolaryngologists made of his ideas regarding deafness. *I can find no evidence of this particular guild after the 1920s of some newspaper reports of the annual service. Perhaps it ended with the Second World War. Her Majesty the Queen, who, as is so well known, is always interested in the deaf and dumb, having heard much of the good work done by both Mr. Pearce and Mr. Owen, expressed her wish to see both gentlemen, and accordingly they had the honour of being presented to the Queen and Her Royal Highness the Princess Beatrice, at Osborne House, on the 16th of January 1886. In 1887 in St. Saviour’s Church in London, Pearce met Frances, the deaf daughter of the former Governor-General of Canada Charles Monck, (4th Viscount Monck). They married in April 1888. Frances was 43 at the time, and her father, reluctant to give his consent, said “they will be very poor” (Eagling). The couple settled in Southampton where Pearce was working for the Winchester Diocesan Mission to the Deaf and Dumb. In 1891 the mission opened a new church in Southampton, the building of which was partly financed by Sir Arthur Fairbairn and his sister (Eagling). Richard Pearce spent his life in the area continuing his mission activities, ministering to the local Deaf community. He acted as interpreter at the funeral of his old teacher William Sleight in Brighton in 1912. He retired in 1924, dying at his home in Winchester in 1928. His wife Frances survived him by just two years. Deaf history. British Deaf News, 1997, Nov, 7. 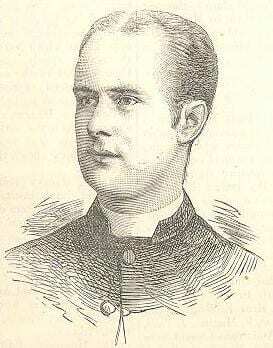 EAGLING, G.J., A deaf clergyman. Deaf History Journal, 2002, 6(1), 16-31.